Source: U.S. Census Bureau; ACS 2012 5 yr. In 2012, more than 81,000 people moved into the Kansas City metro. 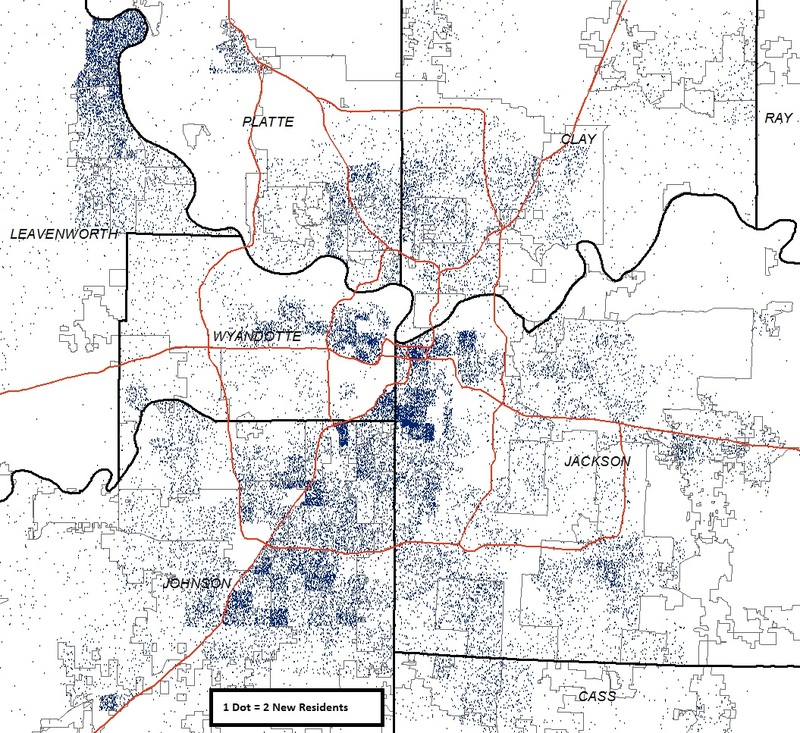 Of this population, nearly 19,000 (23 percent) settled in Kansas City, Mo. 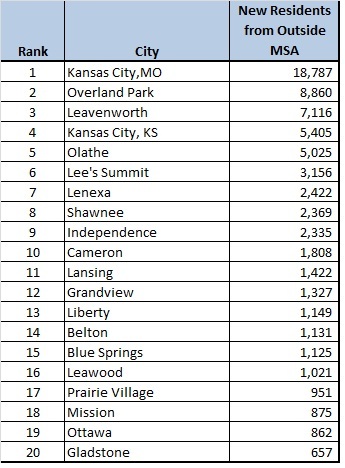 Overland Park was a distant second on the list with 8,860, followed by the city of Leavenworth. Leavenworth is an unusual case, with the bulk of its migration being tied to military service (or the prison!). The table shows the regional cities with the most new residents from outside the region. Like Leavenworth, the presence of prisons in Cameron and Lansing has boosted their numbers. It is more interesting to dive deeper into the data and see more precisely where these new residents settled. The census bureau provides this data at the census tract level, which is illustrated in the map below. There are some clearly defined pockets that tend to draw residents new to the area. First, the area stretching from the Rockhurst and UMKC campuses through the Plaza and into the KU Medical Center neighborhood stands out. In those tracts, more than 12 percent of the current population moved into the Kansas City area in the past year (3,030 out of 24,597). This makes sense considering the large numbers of students moving into the area. As we mentioned earlier, Leavenworth stands out on the map; 20 percent of the city’s current population lived outside the Kansas City Metro one year earlier. In northern Johnson County (just west of Metcalf in Mission), there is a census tract that has large concentration of new residents as well. This is an area with a lot of apartments that may attract recent graduates who are moving to the area. Overall, 18 percent of the population in this tract lived outside the metro area one year ago. Beyond these pockets, it would appear that Johnson County is a more popular destination for new residents than the Northland or Eastern Jackson County. This is a relatively new and rich dataset that we are just starting to analyze. Stay tuned for more.